2go Travel Promo 2017: Travelling by boat has been one of the many fascinations to a lot of travelers and those on expedition in the past. Discovering new islands and exploring the depths of the sea and finding different cultures when one reached to a new land. Come June 2017, 2Go travel has been of service to a lot of businessmen, both local and foreign tourists and a lot more. But do you really have an idea on how much fare are you going to pay? Well, we will be glad to assist you on some important sea route destinations. 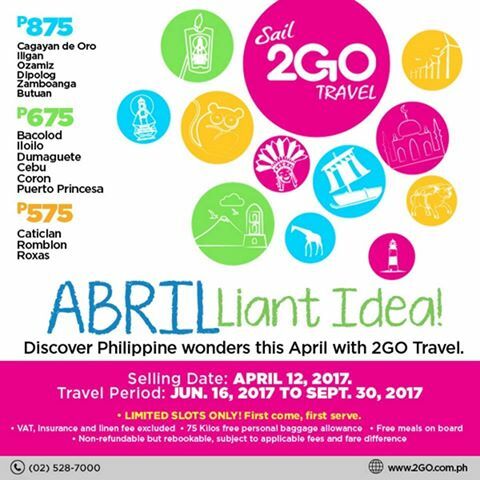 2go Travel Promo 2017-ABRILliant treat to all sea travel passengers! Summer is obviously felt in our tropical country, Philippines. And 2Go Travel has just launched this very affordable promo fares that's available only today. Of course, limited slots only and on a first-come, first-served basis. So what are you waiting for? Grab this opportunity now. It's a perfect time to discover the hidden beauty of our Archipelago. We have lots of tourist destinations that one can visit and explore.